A year after intensive work on creation of a portal which unanimously represents the activists’ request for integration of Kosovo into digital world, and just seven months after going online, Digital Kosovo now moves a step forward. Regardless of 3500 sent requests, 63 successful cases and 30 cases in progress, the list of institutions which have not listed Kosovo in their country list still remains long. To positively change this situation the contribution of each citizen is needed. Therefore, to ease the process and to further intensify the work, with the generous help of IPKO Telecommunication LLC, we have created a mobile application which is now waiting for users’ actions. 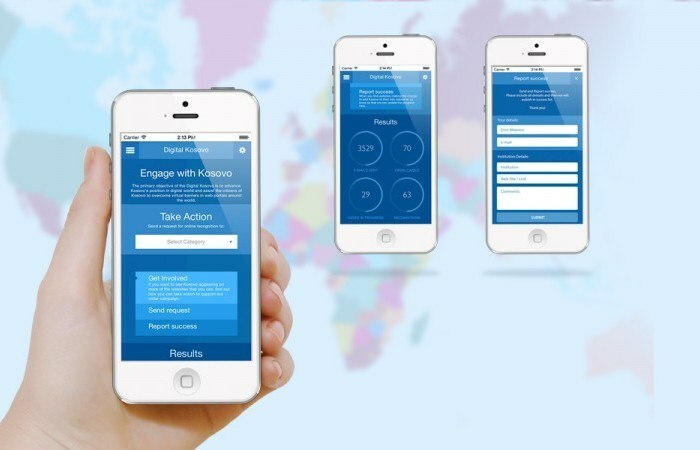 The Digital Kosovo application can now be found in App Store. It is available for iOS, and soon will be for Android as well. To further ease the work of the digital diplomats we have also made application available in two versions- Albanian and English. Please check this link to see how the application works. To download it- click here. For us here at IPKO Foundation, each suggestion and comment about the application functionality is of a major importance. Whereas, of the most significance is the action being taken and requests being sent by Digital Kosovo users. We have only created a tool to ease the work. The success is attributed to each member of the active community and only together we may celebrate the success.